Happy Games :) | Blot Interactive | Imagination at play. A core principle at Blot Interactive is keeping it happy. We look for the happy in life and the happy in video games. Our bread and butter is in making people happy through play. So we wanted to share some of the games that make us happy, highlighting the games in our life which we think could bring joy to others! Since we’re spending a lot of time developing for mobile we wanted to highlight the games in the mobile game scene that we’ve been loving lately. Enjoy! We love this internet phenomenon kitty collector. The cute little kitties that populate our virtual yards and living rooms all have different personalities and are all equally endearing in their own ways. The multitude of cat toys, foods, dishes and upgrades to our houses allow a multitude of creative possibilities for your cat paradise. 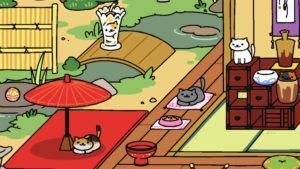 There’s a whole lot of cute and a heck load of fun to be had in Neko Atsume. 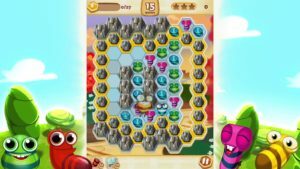 Our CEO Norma Rossler absolutely adores the little acapella musical numbers in between the different levels of match three puzzler Bee Brilliant. With a punny name like Bee Brilliant right away you can tell this is a game that wants you to have fun. With over 1000 levels of puzzles and loads of bees to meet you can check out Bee Brilliant for free and listen to all the adorable little songs you want. 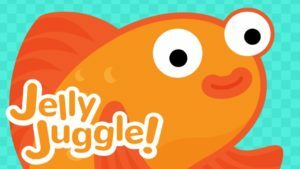 Jelly Juggle is one of my favourite games of 2017. This game features a very simple mechanic: touch the screen to move the fish along in a circle and keep the fruits in the centre of the screen. The levels are broken up into different fruits you’re juggling. It’s simple to learn but once you really get into it you realize there are patterns you have to figure out as each fruit reacts differently to hitting the fish. There have been many levels added since launch which has had me coming back Jelly Juggle over and over the past months. It’s a game that’s made me quite happy since downloading. That’s just a couple of the happy games we’ve been playing in our day to day. If you want to keep up with this blog and our studio and see some of the happy games we’re making be sure to follow @BlotInteractive on Twitter and if you want to follow me you can catch me @StephanReilly. Thanks for reading!